ATLANTA – March 17, 2019 – On a picturesque day in Downtown Atlanta, more than 11,000 runners and walkers kicked off their St. Patrick’s Day at the Publix Atlanta Marathon, Half Marathon & 5K. The race, which Atlanta Track Club renamed this year, featured a brand-new marathon course on which runners from across the country took a running tour of Atlanta’s historic and eclectic neighborhoods, parks and tourist attractions. The marathon was won by Bryan Morseman of Bath, NY who finished in 2:29:11. Morseman led from the beginning on the new course that started and finished in Centennial Olympic Park and traveled through Edgewood, Martin Luther King National Historic Park, Piedmont Park, Grant Park, the Atlanta University Center and underneath the Olympic Rings and Cauldron structure from the 1996 Atlanta Games. The victory marked Morseman’s second win in Atlanta, as he also took first place in 2017. By his own count, the 33-year-old has won 68 marathons out of the 106 he’s entered, part of a journey that began when his four-year-old son was born with spina bifida. Morseman began running marathons across the country as part of an effort to raise money to pay for his son’s medical bills and to inspire his son. “When I’m out there hurting, I think about him and think about my family back at the finish line and it really gives me the motivation to not give up,” he said. Morseman won $1500 for his victory today. Hometown runner Andrew Heath finished second in 2:38:54 and Jonathan Gomez from Alpharetta finished third in 2:42:19. On the women’s side, Gracie Gunther Griffith, a 20-year-old and 2016 graduate of Grady High School, won the marathon in 3:00:52. The victory marked the start of her spring break from Clemson University, where the former Atlanta Public Schools Cross Country Champion is a double major in economics and criminal justice. On a day that saw her run past her alma mater en route to the win, Griffith noted the crowds that cheered her on along the way. Kathleen Turchin and Amanda George rounded out the top three in the women’s race, finishing in 3:12:20 and 3:13:36, respectively. 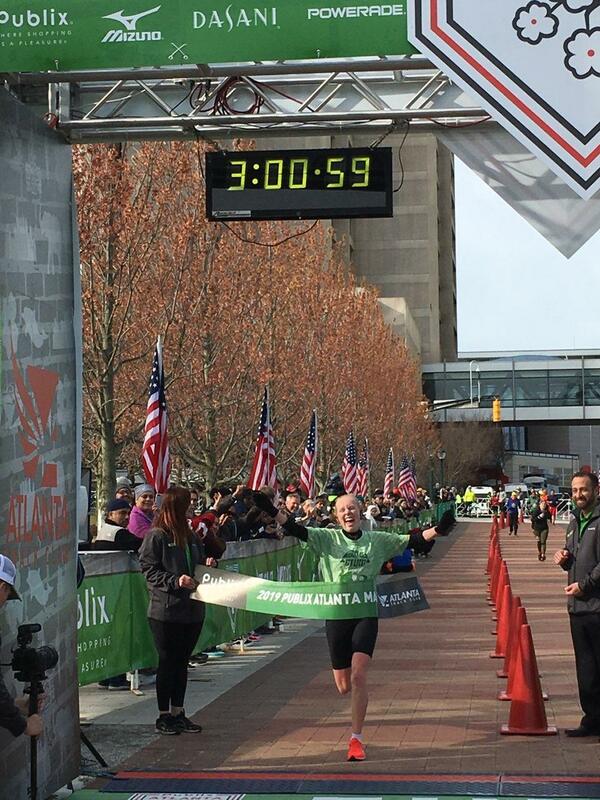 Earlier in the morning, the women’s half marathon was won by Kelsey Hodges, who finished all alone in 1:19:12. 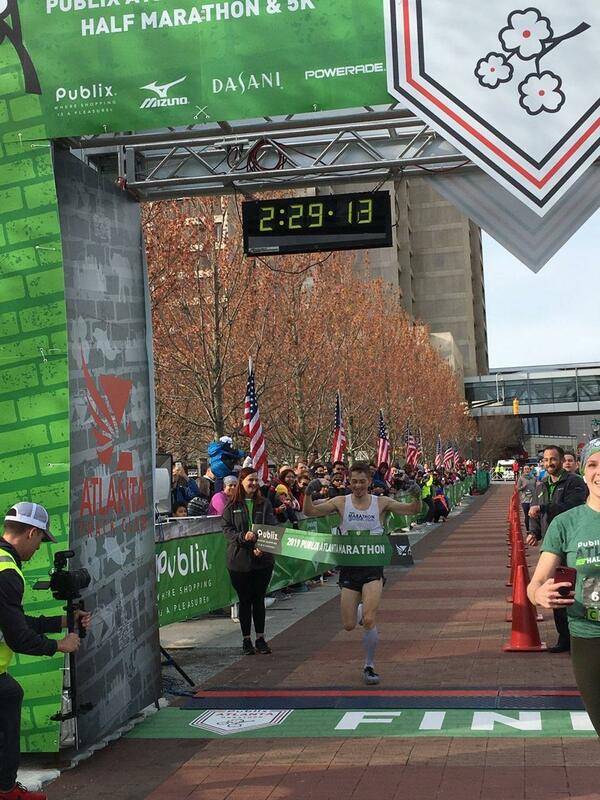 The Huntsville, AL native, who has qualified for the U.S. Olympic Team Trials – Marathon in 2020, was racing for the second time in three weeks in Atlanta after competing at the Road to Gold two weeks ago. She finished more than four minutes ahead of Lauren Duisberg, who finished second in 1:23:44, and Tara Carr, who finished third in 1:24:12. The men’s race was won by Patrick Ollinger, who broke away to take the win in 1:12:25, just five seconds ahead of Jack Bordoni, who finished second in 1:12:30. The victory notched a second straight win for Ollinger who runs with the ITL training group from Brookhaven. The half marathon race also included more than 230 push-assist teams competing with the Kyle Pease Foundation. The foundation, which provides athletes with disabilities the opportunity to compete in endurance races, raised more than $100,000 as part of their fundraising efforts for the race. The first winners of the day were Andrew Hull and Brigitte Mania, who took victories in the 5K in 16:12 and 18:03, respectively. They were two of more than 20 winners of the Terrapin and the Hare challenge, in which Terrapin Beer Co., the official beer of Publix Atlanta Marathon weekend, rewarded runners who finished ahead of their terrapin mascots with beer tap trophies. The weekend also included the Publix Atlanta Kids Marathon on Saturday morning, which featured kids ages 14 & under crossing the same finish line as today’s participants. More than 700 children competed in a 2.62K, 262m Dash and 26.2m Dash and watched a mascot race that featured Freddie the Falcon, Buzz the Yellow Jacket, Scrappy the Owl, Pounce the Panther and more racing through Centennial Olympic Park. As the weekend wound down, the Club had already begun turning its attention to next year’s marathon weekend, during which Atlanta will play host to the 2020 U.S. Olympic Team Trials – Marathon. Atlanta Track Club will serve as the Local Organizing Committee for that race, which will take place on February 29, 2020. Next year’s Publix Atlanta Marathon will take place the following day, on March 1, 2020. Registration for the 2020 Publix Atlanta Marathon, Half Marathon & 5K opens Sunday afternoon.